In the future, billions of small graphene-based nanoscrolls could be used to develop water filters. A single, atom-thick layer of graphene is rolled up to make a single scroll. Each scroll can be custom made to trap particular molecules and pollutants in its firmly wound rolls. A highly selective, durable, and lightweight water purification membrane can be developed by stacking billions of these nanoscrolls in layers. The catch lies in the fact that graphene is an expensive material. It has unique chemical and mechanical properties because of its hexagonal structure, which looks like a microscopic chicken wire. Scientists work hard to maintain graphene’s flawless and pure form, using methods that are both time-consuming and costly, and that majorly restricts graphene’s practical applications. A team of researchers from Harvard University and MIT are searching for an alternative. Graphene oxide is being considered, which is an imperfect and much cheaper form of graphene, enveloped with hydrogen and oxygen groups. When left in open air for a long time, graphene oxide reacts the same way as graphene. The researchers used flakes of graphene oxide to form nanoscrolls, and were able to monitor the dimensions of every single nanoscroll by using both high- and low-frequency ultrasonic methods. The nanoscrolls can be developed in a cost-effective manner, and comprise of similar mechanical properties to graphene. If you really want to make an engineering structure, at this point it’s not practical to use graphene. Graphene oxide is two to four orders of magnitude cheaper, and with our technique, we can tune the dimensions of these architectures and open a window to industry. Stein highlights that graphene oxide nanoscrolls are capable of being used as water filters, drug delivery vehicles, ultralight chemical sensors, and hydrogen storage platforms. Carlo Amadei, a graduate student at Harvard University, and Stein have published the results of their work in the Nanoscale journal. Originally, the team’s paper was delivered in an MIT class, 2.675 (Micro/Nano Engineering), handled by Rohit Karnik, associate professor of mechanical engineering. Amadei and Stein together developed nanoscrolls from graphene oxide in their final project. As part of a group headed by Brian Wardle, professor of aeronautics and astronautics at MIT, Amadei, as a member of Professor Chad Vecitis’ lab at Harvard University, has immense experience in working with graphene oxide for a variety of water purification applications, while Stein has experience in working with carbon nanotubes and many other nanoscale architectures. Our initial idea was to make nanoscrolls for molecular adsorption. Compared to carbon nanotubes, which are closed structures, nanoscrolls are open spirals, so you have all this surface area available to manipulate. Having examined earlier works in this field, the students discovered that researchers had successfully created nanoscrolls from graphene, although with extremely complicated processes to maintain the purity of the material. A few other research groups attempted to carry out the same process with graphene oxide, but all their attempts were not successful. What was out there in the literature was more like crumpled graphene. You can’t really see the conical nature. It’s not really clear what was made. 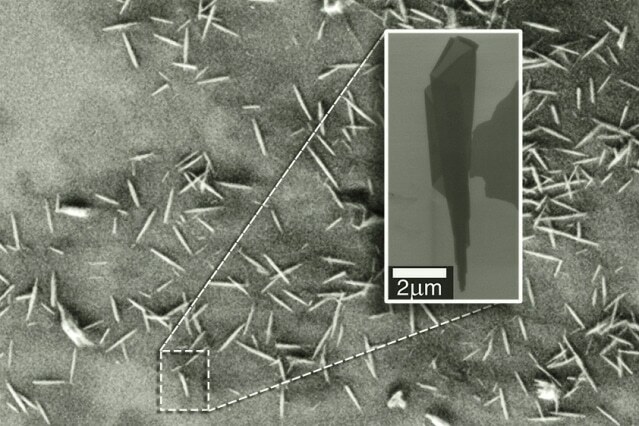 Amadei and Stein initially used the Hummers’ method, which is a common method used to seperate graphite flakes into separate graphene oxide layers. The flakes of graphene oxide were then added to a solution, following which the flakes were stimulated so that they curl into scrolls. Amadei and Stein carried out this process by using a high-frequency custom reactor and a low-frequency tip-sonicator. The tip-sonicator is made of piezoelectric material that shakes under a low, 20 Hz frequency voltage. When added to a solution, the tip-sonicator generates sound waves that form bubbles in the solution after stirring up the surroundings. The research group’s reactor has a piezoelectric component linked to a circuit. On applying voltage, the reactor shakes and forms bubbles in the solution present within the reactor. In comparison with the tip-sonicator, the shaking of the reactor takes place at a higher, 390 Hz frequency..
Stein and Amadei used both these methods to solutions of graphene oxide flakes and discovered similar effects. The bubbles formed in the solution ultimately collapsed and released energy, allowing the flakes to curl into scrolls in a very spontaneous manner. The researchers discovered the possibility of tuning the dimensions of the scrolls by changing the frequency of the ultrasonic waves and the treatment duration. Shorter treatments and higher frequencies cause no major damage to the graphene oxide flakes and developed larger scrolls, while prolonged scrolls and low frequencies developed smaller scrolls and tended to divide the flakes. A minimal number of flakes were turned into scrolls by the initial experiments executed by the researchers. Stein highlights that both methods can be optimized to develop higher yields. He further said that if this is scaled up, it would be possible for the methods to become compatible with the currently used industrial processes, especially for water purification. If you can make this in large scales and it’s cheap, you could make huge bulk samples of filters and throw them out in the water to remove all sorts of contaminants. This work was partially supported by the Department of Defense through the National Defense Science and Engineering Graduate (NDSEG) fellowship program.